The incredible Giles G-200 unlimited aerobatic competition machine, which, if the Goddess smiles on me, I hope to build someday. The G-200 is made of carbon fiber composite and is very small, light and aerodynamically clean. The use of this space-age material allows it to achieve Unlimited category performance with a 200 hp 4 cylinder Lycoming engine. This gives performance comparable to more traditional Unlimited category machines using much more expensive 300 hp 6 cylinder engines. The small wingspan, huge ailerons, and very low inertia of the wings give it an incredible roll rate, in excess of 400 degrees per second. The G-200's vertical performance is simply unbelievable: 2800 feet from its top speed of 220 knots. 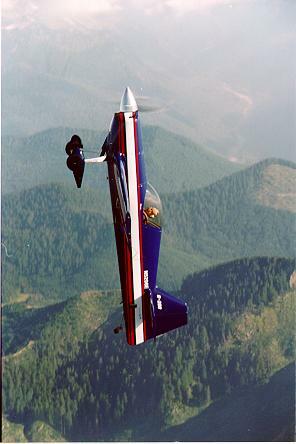 Airshow pilot Sean Tucker has done twelve vertical rolls going up before running out of airspeed. Contact Akrotech for more info. Tell 'em I sent you.